There are many unique immigration stories, but none are exactly like my dad’s story. It consists of many hardships and much patience. Although there were a lot of responsibilities and much loneliness, I must say that my dad conquered them all. My father was from Southern Vietnam and lived quite a normal life with his family. That is until, suddenly, civil war was initiated by the Communist North with the support of China against the free southern part of Vietnam, who was later supported by the U.S.
My dad’s name is Dac Cong Tran and he is from Vietnam. Before the civil war broke out, my father and his family lived on a small farm in the southern part of Vietnam. He had about twelve siblings and they lived a normal life. They didn’t have much time for school because they helped their parents harvest plants on their farm. They did not have much besides the food that they ate every day. They would eat what they had and did not make or have much money. They didn’t live in a fancy house or anything. Their house contained walls of cement, but it had a roof made from coconut leaves and their home did not have any doors. It was a simple home, not like the homes today. Even though life was hard back in Vietnam, it was sustainable. They lived a lower-to-middle class existence back in Vietnam, and their lives were much different from today. They only went to school until college and they did not have any type of transportation, so they mainly had to walk to school, which could be for miles each day. They lived a hard life in Vietnam, but the reason that they wished to leave was because North Vietnam had taken over South Vietnam and had become Communist. The government had complete control over everyone, and anyone who went against them was punished harshly. People had no freedom and had to obey the government. They lost most of their rights to the government. The citizens were nothing and couldn’t do anything if they didn’t have money. The government controlled what was in the religion that they believed, and they told people what they could and couldn’t say. If they felt that someone had said something that they didn’t like the government would punish them. Furthermore, if they didn’t like a person then they could blame that person for anything and they couldn’t defend themselves. They had their own radio broadcast set up by the government to make fake news and to spread propaganda to people every day, brainwashing them into believing whatever it said. The government was corrupt and my dad didn’t want to live under it anymore. Furthermore, he wanted a better life for his family so he went off first to try to pave the way for his family. The journey was a route heading out of Vietnam through other countries. My father went by foot and walked with a group of people outside of Vietnam, first to Cambodia, a neighboring country to Vietnam. The route was tough and my dad didn’t have many belongings. They walked with the sandals they had. They brought some food, water, and money with them but not much, so they made their way through Cambodia quickly. 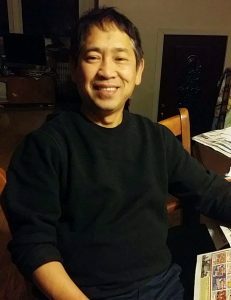 He walked through Cambodia to a Thailand refugee camp where he submitted his papers and requested to be transferred to the U.S. After doing this, he lived in the refugee camp for about two years awaiting his answer for placement. In this camp he stayed in a house similar to his home in Vietnam, but it was more devastated. Every week he would live on two cans of fish with water. Finally, after two long years of patience and hard living, he was finally accepted into the U.S. He was sponsored by the Catholic church, flown into the U.S. by plane, and resettled in Illinois. He was twenty-six when he had arrived in the U.S. for resettlement. Upon arriving in the U.S., my dad had to work to try to create a stable living for the rest of his family to come. He first started as a farmer in Nentemeno, Illinois, for a short period of six to ten months to make some money. Soon after that, he had saved enough money and had moved upstate and rented an apartment in Wheaton, Illinois. Since he was a farmer no more, he obtained a job at Wheaton college as one of the custodians at the age of twenty-seven. He also went to school there. While trying to become a mechanic, he was working there as a custodian. It was hard studying and working because he had to work many hours to care for his ten family members who were staying with him. Even though he didn’t have much time or energy, he studied hard and graduated with a Bachelor’s Degree in Mechanics. While taking his courses, he ran into my uncle and, through my uncle, he met my mom. Where is my dad right now? My dad has obtained a better life and currently has a successful shop in Chicago. He lives in the suburbs, in a regular house, with a happy family. He’s happy with where he is and grateful to be married to my mom. He has more than enough to support his family, and he would say that he did reach his goal in the U.S. He is able to live the life he wants and doesn’t have to worry about the government or money. He has four children who are attending universities and high schools. He says that he would do it all over again if he had to. The only thing he regrets is that he wishes that he could’ve done better in school to get better grades. My dad is also part of many community groups. His hopes for the future now is that all of his children will succeed in life and finish school. He hopes that they have a successful life and that they will have families of their own. My father is a great person who has gone through much for his family. Through his hard work and effort, his family is doing well; they are no longer struggling from the lower levels of society and have a great and evolved life. This story was written by Joseph Tran, the son of Dac Tran.